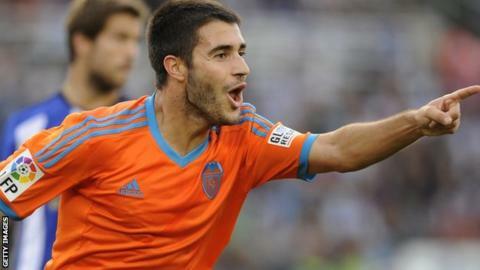 Aston Villa have signed midfielder Carles Gil from Valencia for £3.2m on a four-and-a-half-year deal. The Spain Under-21 international, who spent the past two seasons on loan at Elche, has scored one goal in eight La Liga games for Valencia this term. Villa have scored just 11 goals in 21 Premier League games this season. "We've been on the lookout for a creative player and he will certainly bring that extra element to the side," said Villa boss Paul Lambert. "He's only 22 but he will come here and give us something I don't think we have at the moment. "He can play either role, coming in off the sides or playing in behind as well. "He can create chances and get those chances put away. He has a lot to offer and I know we can get the best out of him." BBC Sport's Pat Murphy said: "Gil arrives with the reputation of a player who can go past opposition players swiftly in the area where Villa are blatantly deficient - the final third of the field." Lambert's side are without a win in six Premier League games - scoring just one goal in that period - and are three points clear of the bottom three. Speaking after Saturday's defeat at Leicester, Lambert, who has also been linked with a Manchester City's Scott Sinclair, said: "We need a bit more creativity, that's the only thing that is lacking."